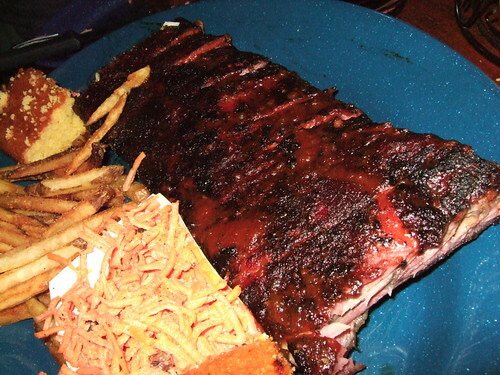 People have been talking about Dinosaur Bar-B-Que since it opened in 2004. I just didn’t have a clue about how many people. Jase and Mia came down from Brooklyn to eat barbeque with the Dr. and me one weekend. I was surprised that only a 9pm table was available for four people but I was flabbergasted when the restaurant was crowded. Sure, it was basketball night, but this is uptown and way above 14th Street. Where did everyone come from? I felt guilty that I was the last one to make an effort to visit. And I live about fifteen blocks away! I’ve gone through lengths to eat a good barbeque. I once spent $70 for a round-trip cab ride from the Houston airport to find Burn’s BBQ after an Anthony Bourdain episode. I’ve even smoked my own 8-pound pork shoulder. Dinosaur Bar-B-Que makes eating good barbeque in New York City easier for fanatics like me. Their kind of barbeque is my favorite. The meat is moist and falls off the bone with a dainty touch of the fork. There’s a very faint sweet taste which makes the burnt ends even better. Everything else on our table was icing on the cake.